Indian Railways Recruitment for vacant positions of constable posts under RPF department. 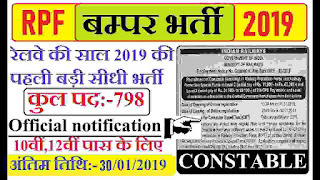 Railway Protection Force (RPF) Recruitment 2019. There are total 798 vacant positions which are going to be filled up through this RPF Recruitment 2019. The online railway job applications are invited from qualified Male as well as Female applicants from India for the recruitment of Constables (Ancillary) in different trades in Railway Protection Force (RPF). Indian Fresher candidates who are looking for the railway jobs in India under RPF department can apply for this Railways Protection Force recruitment 2019 through online process which will be begin on 1st January 2019. Applicants should go through the RPF Recruitment Advertisement sensibly and carefully before applying this RPF Recruitment for constable posts . More information related to these railway jobs in India is given below in this article. We currently take this information from the Employment Newspaper published on 22nd Dec. to 28th Dec. 2018. The official notification will be published on 1st Jan. 2019 on the Indian Railways website. We share the employment newspaper file under IMPORTANT LINK section at the last of this article. Educational Conditions: Indian fresher candidates who have passed in their 10th class examination from a well-recognized education board of India can apply for these railway jobs in India. Age Bond: Indian applicants age be less than 25 years and more than 18 years for applying this RPF Recruitment for constable posts 2019. 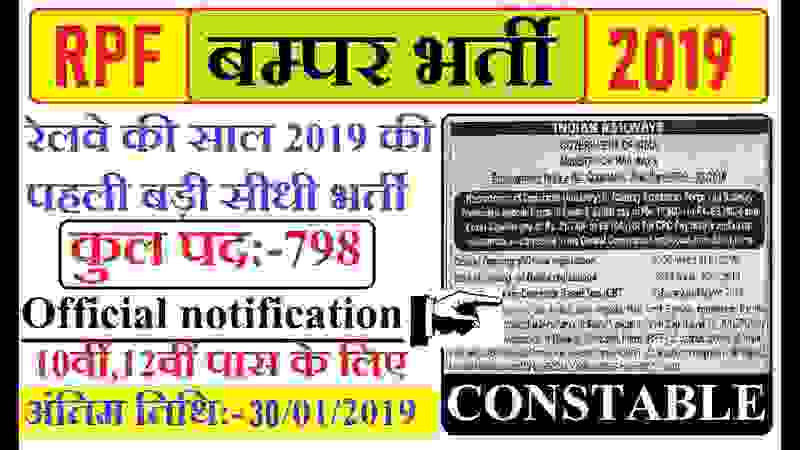 Candidates can apply online for this RPF recruitment 2019. There is no other way for applying these railway jobs in India. The Link for applying will be activated on 1st Jan. 2019 and this link will remain activated up to 30th Jan. 2019. So the eligible candidates from India can apply online between these dates. No offline application will be accepted by the RPF Recruitment department. So apply online. 30th Jan. 2019 is the Last Date to apply.